I am a new contributor to the FCC codebase. I have successfully ran the FCC web app on my local machine but there is something I find quite irritating. I am adding a new test in the markdown file of a challenge but upon changing it the changes are not hot reloaded to the local server. So I have to go on, restart the whole building the project thing every time I make a change. Am I missing something? Should the work flow actually be like this? Thanks. Everything seems to be running fine, bar the absence of changes visible on the local live server. I’ve sync’d my fork to the FCC repo. As you can see in the image below, mongo is up and running. I’ve ran npm run seed and npm run develop without errors. I’ve edited and saved the challenge markdown file, adding a few more 'S’s to the first word, (Suppose -> SSSSuppose). I’ve refreshed the page, but nothing has changed. Am I missing something? Should the work flow actually be like this? It appears the workflow should be like this. 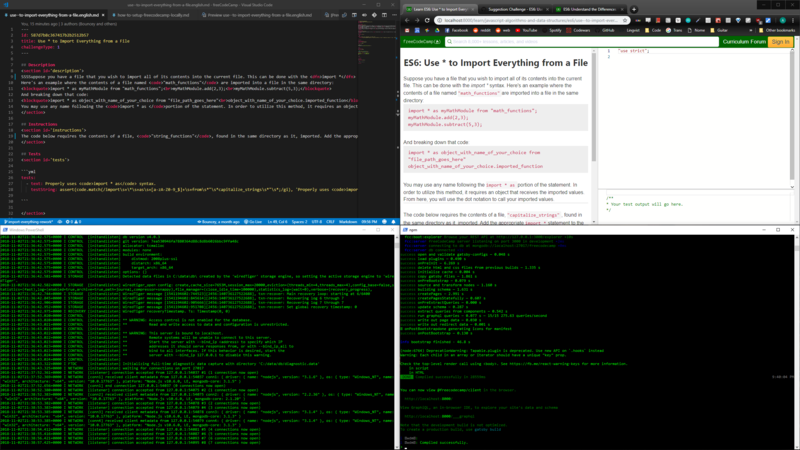 If you want to preview changes you’ve made to a challenge .md file in a browser: In the project root directory, you run ./node_modules/.bin/lerna run build --scope @freecodecamp/curriculum followed by npm run develop.